Express your love and commitment with this stunning wedding ring from The Forever Diamond. 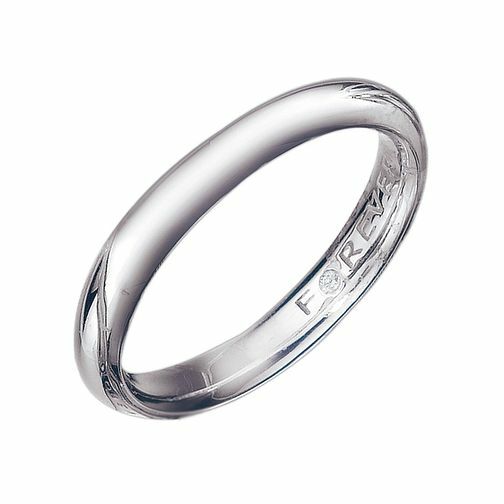 Measuring 3mm wide and crafted from luxurious 9ct white gold for a classic look, this elegant wedding band has the word Forever engraved in the inner shank and is set with a single diamond. 9ct White Gold 3mm Forever Diamond Wedding Ring is rated 5.0 out of 5 by 1. Rated 5 out of 5 by Anonymous from Perfect Ring for perfect day This ring matched my engagement ring from the forever range. It is plain and therefore does not out shine my beautiful engagement ring. They look beautiful together. I also save £50 by ordering online.